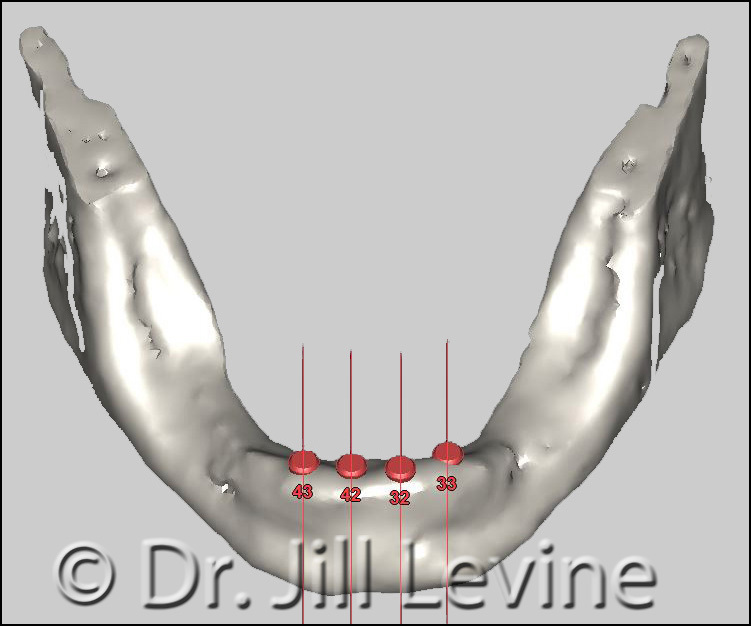 Bone grafting during tooth extractions is currently the most reliable way to ensure that patients retain sufficient amounts of bone for future dental implant placement. The patient below is a female in her early 80’s who had worn a lower partial denture for many years along with a complete upper denture. She had 6 remaining lower teeth that had become badly decayed and needed to be extracted. She was concerned about being able to retain and function properly with a complete lower denture, so decided to replace those teeth and her current partial denture with an implant-retained lower denture. 3D imaging (below left) revealed that the decay on her remaining teeth had caused an infection within the teeth and the surrounding bone, leading to significant bone loss in the area. This lost bone needed to be repaired in order to place 4 implants in the ideal locations to support an implant-retained lower denture. 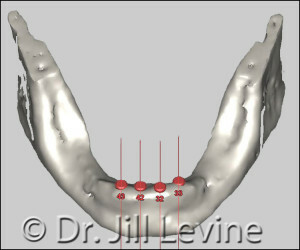 In one area in particular (the patient’s lower left jaw) the infection had created a crater making suitable length implant placement in that critical location impossible. Extraction and bone grafting were performed, and the area was thoroughly cleaned, to remove any infection. 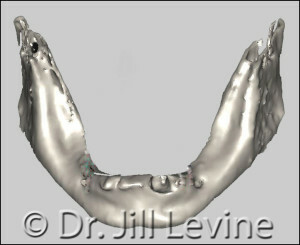 After 3 months the area was re-scanned (Above right). 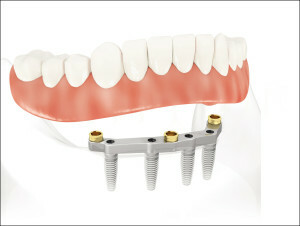 A substantial amount of bone regeneration was achieved with bone grafting the sites at the time of the extractions, which provided a solid foundation for her new implant-retained lower denture.